This Friday, April 19 is Good Friday and Monday, April 22 is Easter Monday. There is no school for students. Wishing you a blessed and joyful Easter! 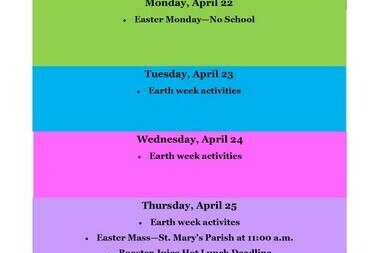 Week at a Glance for the week of April 22-26. 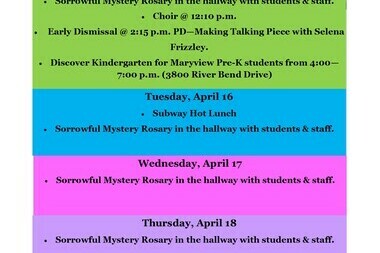 There is no school this Friday, April 19 and Monday, April 22. Easter blessings to you and your family. 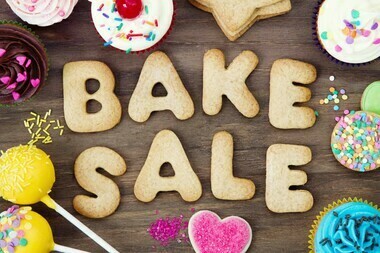 Bake Sale tomorrow starting at 11:30 a.m. with all proceeds going to Ronald McDonald House. All items will be sold for $1.00. Join us for this free event to celebrate the cultural diversity in our school.